Peter Bowes: When will the Murray verdict come? When will the Murray verdict come? Waiting outside the criminal court building in a chilly, sun-deprived, tree-lined street in Downtown LA, the air is thick with anticipation and diesel fumes from the media trucks and inner city buses. Rival (but small) groups of Michael Jackson and Conrad Murray supporters try to out scream each other. "Justice for Michael..." "Victory for Conrad." The media is out in force, with reporters breathlessly interviewing the assembled throng of self-appointed legal experts and local loud mouths. Occupy LA people across the road join in, to muddle the message further. 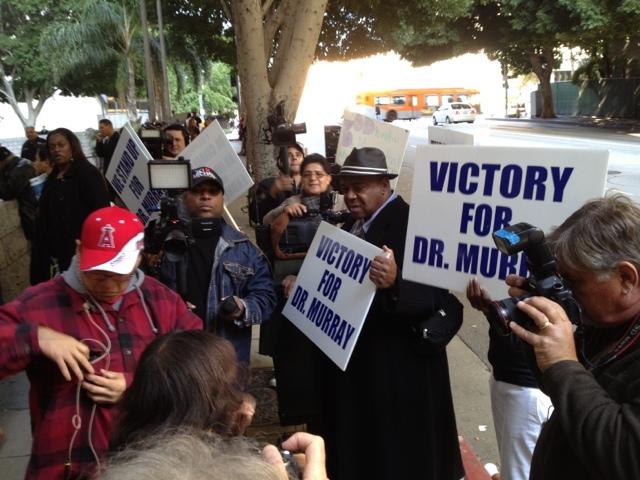 Inside the building, 7 men and 5 women are deciding Dr Murray's fate - guilty would mean up to four years in jail for the involuntary manslaughter of Michael Jackson. It's day 2. Lunch is an hour away.